Our organization is engaged in supplying a superior quality range of Sewage Treatment Plants, which are widely used for removing physical, chemical and biological impurities from the water. The Water Treatment Plants are extensively used in all leading factories and chemical industries. We offer these Water Treatment Plants to our valued clients at very competitive prices. We also offer drinking water disinfection technologies for small communities. We offer automatic, continuous online chlorination using CDB -56 (Chlorun) in the form of powder granules having high stability and good self life. We have engraved a distinct and dynamic position in this market by offering an unblemished quality of Sewage Treatment Plant. Offered treatment plant is based on cutting-edge technology and is provided with full guidance from designing to installation and maintenance. This is manufactured under the supervision of our adroit professionals as per predefined standards of industry utilizing finest quality components. 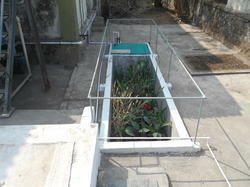 Furthermore, we are offering this treatment plant at pocket friendly prices. break the problem down into onsite, manageable and economic solutions. reduce energy needs for transport of water and eliminate needs for failure-prone piping. • Long lasting, self sustaining system. plantations. No by-products such as sludge. • High endurance under extreme water flows and contaminant loads. Lakes Remediation & many more.